If you're on the hunt for a TV to fill a small space, trying to find a modest model is no mean feat. Our guide, which includes models up to and including 32 inch TVs, is designed to point you in the right direction of smaller-sized models that will work for your home and requirements. For more advice on choosing a TV and finding the right model to suit your needs, browse our televisions hub page. Our pick of the best TV deals is a must-read if you're on the hunt for a bargain, too. When choosing a small TV, you'll want to start by thinking about the size – after all, 'small' can be quite an objective term – as well as your desired resolution. Picking the best small TV for you really depends on what you’ll be using it for: most are smart TVs – see our specialist guide – ideal for streaming and catch up apps, but remember that you will pay a premium for such technology. You won’t find 4K resolution on a small TV, either, so if that's what you're after, you'll be better off browsing our guide to the best 4K TVs. However, if you’re all about your movies, then you can create a smaller yet immersive viewing experience with a curved screen. Additionally, if you want a gaming TV (once again, see our buying guide), then one with a gaming mode will ensure fast and responsive gameplay. This HD TV may be the smallest on the list, but its excellent picture and sound quality make it a popular choice for rooms such as the kitchen, where there is limited space. The TV can be wall mounted and features over 60 Freeview channels and 20 radio stations for unlimited entertainment. There is no smart hub, but you can always connect a range of devices via HDMI should you wish to. Browse more 20-inch TVs on Amazon. Looking for a small TV for your caravan, motorhome or boat? This TV's low power consumption matched with the included 12v and 24v adapters make it the best small TV you can buy for a motorhome, caravan or boat. At an ideal size of just 20 inches, it has a built in Freeview and DVD Player so you can watch your favourite TV or films, and also a USB PVR facility to pause and record your programmes. Although some reviewers say the sound can be slightly tinny, for a price tag as low as this one, you're still getting a bargain. Take a look at the full range of 20-inch TVs available from Appliances Direct. This little 22-inch Samsung model is just the right size for a small bedroom or guest room and comes with built-in Freeview for easy watching of all your favourite channels. It doesn’t have a smart hub, but it has plenty of ports and sockets including HDMI and USB so you can connect your laptop or smart device for simple streaming options. This television also has parental controls which makes it a good choice for children’s rooms. View more 22-inch TVs available from Argos. This small TV with built-in DVD player could be ideal for a teen’s bedroom, where they can watch all of their favourite movies and shows on demand. It’s HD ready and has both HDMI and SCART ports so you can also connect other devices such as games consoles. Users have been impressed with the picture quality, although sound could do with some improvement. You can always look to invest in your own sound system such as a soundbar if you’ll be using it frequently for movie watching. Shop more 24-inch TVs on Amazon. With great picture quality and Smart Portal technology that allows you to watch catch up TV and movies, this small but very capable television by Sharp has two HDMI ports for your consoles and DVD/Blu-ray players. If you're after more traditional viewing, the built-in Freeview tuner comes with 70 channels, too. There are also two USB ports so you can view content from USB drives. An ideal piece of kit for those who want a basic, small TV that ticks all the boxes. If you're on the hunt for a small, smart TV, this is your best choice. Take a look at AO.com for more 24-inch TVs. If you are going small not out of choice, but purely because you lack the space for something huge, 32 inches is a decent size to be working with. This Sony Bravia model boasts excellent resolution and smart hub features, allowing you to watch Freeview and catch up. Despite being on the larger end of the scale, it is sleek and slim, so you can expect it to fit nicely into any bedroom space without taking over the entire room. You can even mount it on the wall if you are really short on space; ideal for kitchen or dining areas. Overall, this is our very top pick for the best small TV you can buy. Take a look at the full selection of 32-inch TVs on Amazon. For those who don’t want to part with too much tech due to the size of their TV, this Toshiba model should have everything you need to keep the whole family entertained. You’ll have HD quality Freeview and Freeview Play, allowing you to stream shows from the past seven days. A built-in DVD player will allow you to watch your most-loved movies over and over again, and this TV is very well connected with built-in Wi-Fi and a complete Smart Hub for bringing on Netflix or Amazon Prime. The best small TV if you're after something packed with features. Browse more 32-inch TVs from Currys PC World. The cheapest way into LG’s superb webOS smart platform, the 32LJ610V is a budget 32 inch that’s focused on connected entertainment. The design is pretty unobtrusive, its thin, metallic black bezel relies on two widely spaced feet for support. Unlike many other models of this size, it’s built around a 1080p panel, with image clarity bolstered by LG's Picture Mastering Engine and Resolution Upscaler technologies. If you're on a budget, we recommend this as the best small tv you can buy. See more 32-inch TVs available from Ebay. The Panasonic TX-32ES400B has everything we'd want from a 32 inch TV. Its My Home Screen operating system is quick and easy to navigate, it features Freeview Play for easy access to catch-up services, and you're also able to plug in a USB hard drive to have it record live TV. The only issue with the set is that it's HD Ready rather than Full HD, which means images won't be quite as sharp and crisp as they could otherwise be. For the most part we don't think this is too much of a concern. Full HD only really becomes essential at 40 inches and above, and below that you won't see too much of a benefit. The one exception to this rule is gaming since there are certain games out there that rely on displaying a lot of text on screen, which can often benefit from the extra resolution of Full HD. It's not something that will impact upon everyone, and nor will it even affect every gamer, but it's worth bearing in mind depending on what you intend to use your TV for. High dynamic range (or 'HDR' for short) is the hot new thing in TVs. It increases the maximum brightness of a TV while also allowing it to display blacker or 'truer' blacks, resulting in far more dynamic images. HDR has almost exclusively been attached to 4K TVs, but in 2017 Sony added the technology to its Full HD and HD Ready sets. The advantages of the tech won't be nearly as big for HD sets as for 4K ones, but if you're an owner of a PS4 console (which offers HDR at 1080p) then you'll see at least a marginal benefit. Elsewhere the WE613 is fairly standard for a 32 inch TV. It has the ability to record to an external USB device, and it also offers access to a number of different streaming and catch-up services (although unfortunately it doesn't support Freeview Play to seamlessly hop between live TV and catch-up). Browse more 32-inch TVs available from John Lewis & Partners. Its thick bezel might make it look a little dated, but the LG 32LJ610V's combination of a nice bright screen and snappy WebOS operating system more than makes up for it. The TV is also the first on this list to feature a Full HD panel rather than a lower resolution HD Ready one, which should benefit you if you're going to use your TV to display a lot of text. Freeview Play is included so you should be able to easily access catch-up services, although unfortunately the TV doesn't allow you to record live TV to an external USB device, which might be an issue if a piece of content doesn't make it onto a streaming service after its broadcast. The Toshiba 32D3753DB comes packing a built-in DVD player, which is something of a mixed blessing. On the one hand this is super convenient if you were planning on using the TV to play a lot of DVDs anyway. It means you won't have to dedicate shelf-space to a player, and everything can be neatly controlled using a single remote. But on the other hand this is an HD TV, and it's a shame to be limited to standard definition DVD discs. Regardless, if DVD playback is a priority, then the Toshiba 32D3753DB is a great choice alongside Freeview Play support. If budget is your priority, then the Hisense's 32M2600 is a great choice. 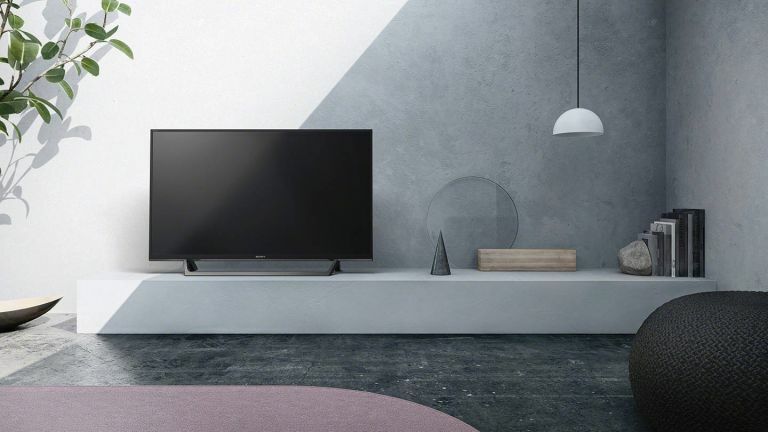 It's got a more limited selection of smart TV features thanks to Hisense's proprietary operating system, and you also don't have Freeview Play to get easy access to catch-up services. Picture and sound quality are also acceptable at this price point. It's not going to blow your socks off, but you can get a lot worse at the budget end of the spectrum. Otherwise this is a well-made budget TV that should serve you well. Browse more 32-inch TVs from Argos.